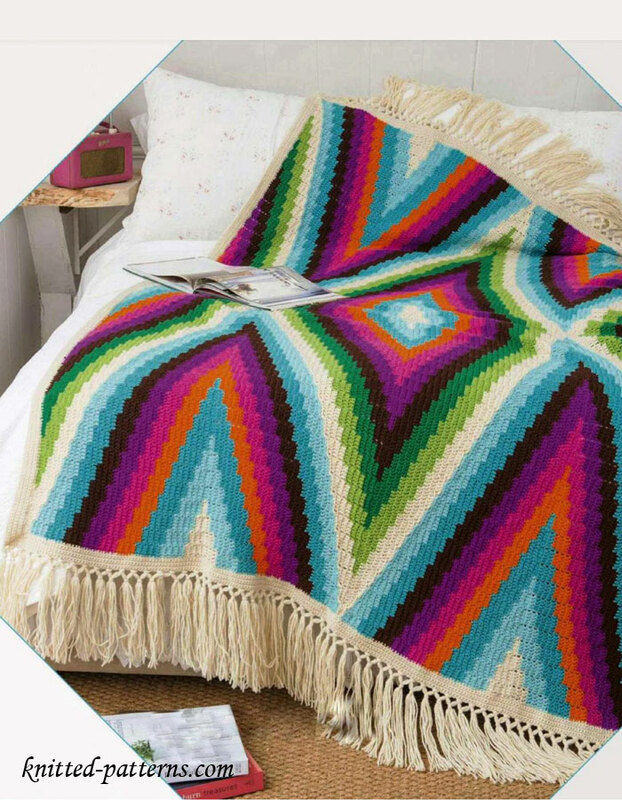 Homepage » Free Crochet Patterns » [Paid Pattern] This Gorgeous Bohemian Blanket Is Crocheted In 7 Pieces. Take A Look. What an interesting design! This Bohemian Blanket by Susan E. Kennedy was inspired by vintage Turkish kilim rugs and Native American tribal designs. The texture has an almost woven appearance and the colors are stunning. It’s almost impossible to see that the blanket is worked in seven separate pieces and sewn together at the end. The blanket is crocheted in 7 pieces and sewn together with mattress stitch. Each piece is worked in rounds or rows composed of blocks of 5 tr sts. The pieces are 1 full diamond, 2 wide half diamonds, and 4 narrow half diamond shapes (see diagrams). Thanks to by Susan E. Kennedy for article inspiration and featured image. 11 Comments to [Paid Pattern] This Gorgeous Bohemian Blanket Is Crocheted In 7 Pieces. Take A Look. I know you have been looking at kinda tribal patterns and th I ones free!